within the school curriculum. Roger was aware of the good work of the CO-OP Education Department and went to the CO-OP to ask if it would become a willing partner. With its long-standing record of choral and musical work the committee had no hesitation in embarking upon what was then an exciting innovation. The music school got off to a phenomenal start with every type of instrument being taught to a huge membership of students. In 2004 it was decided to move the Music School to the CO-OP Education Centre. This was a very successful move with the Music School being very much "at home" in the Centre, a natural environment for learning and Co-Operation through music. The Ensembles grew on Saturday mornings and averaged 80 young people involved in the various groups and individual music tuition. The annual concert became the "CO-OP Music Fest" and ensembles have played at Ipswich Music Day and Brass and Voices Concerts over the years as well as at fundraising events over the Christmas period. In September 2009 the East of England Co-Operative Society sought to make all its groups more self sufficient. 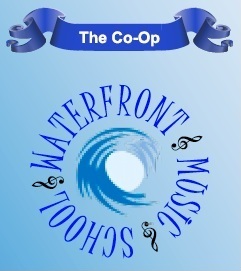 The Music School now funds itself, has its own organising and supporters group and changed its name to the "Waterfront Music School". The East of England Co-Operative Society continues to host the Music school at the CO-OP Education Centre in Ipswich and remains strongly committed to the Music School's aims and objectives.